That's sort of like saying the cutest drag queen at the Super Bowl, I guess—I mean, I don't usually think of the fashion world as being terribly literate. But I suppose it's more literate than the literary world is fashionable. Anyway, lots of the fashion people I know read, and they're all now reading or have recently completed The Beautiful Fall, by Alicia Drake (Little, Brown and Company, 2006). Adding to interest in the book is the fact that Karl Lagerfeld has taken the author to court in France for invasion of privacy ("atteinte à la vie privée"). The idea that anyone who dresses like Lagerfeld, has had a reality show, or has published an eponymous diet book could have his privacy invaded is tres droll, no? Anyway, I'm getting up early to get in reading time, because the book is very entertaining. Alicia Drake, a Brit who lives in Paris and has written for the Herald Tribune and British Vogue, writes stylishly and has clearly done her homework, if not that of the whole class. 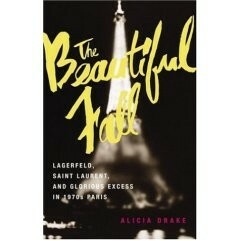 The Beautiful Fall is subtitled Lagerfeld, Saint Laurent, and Glorious Excess in 1970s Paris. It really starts in 1954, with Yves Saint-Laurent, 18, and Karl Lagerfeld, 21, receiving the International Wool Secretariat fashion awards. I just got my copy and I'm only up to the beginning of the seventies, where the action really starts and my old friends and associates, like Andy Warhol, Fred Hughes, Joan Buck, Antonio Lopez, Corey Tippin, and Donna Jordan start showing up, but already this is my most fun read of 2007.